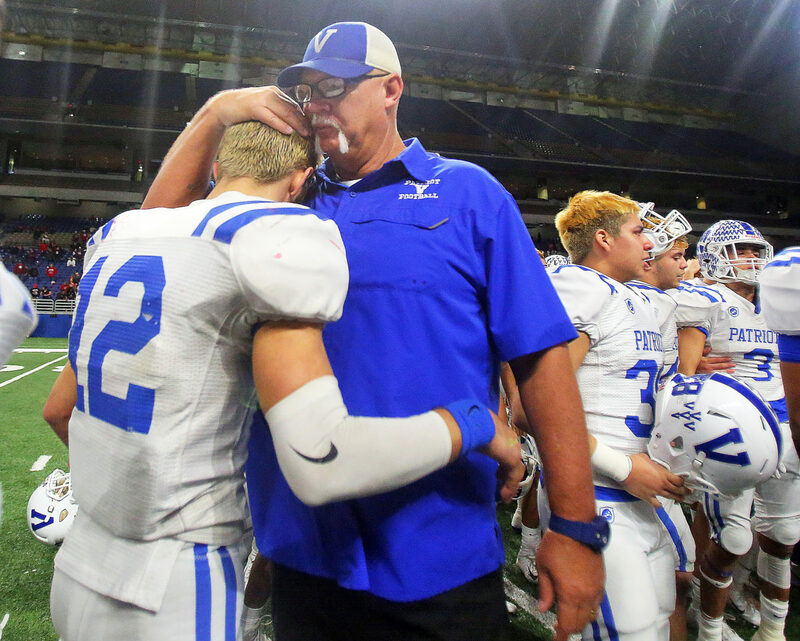 SAN ANTONIO — One or two pass rushers isn’t enough to derail Mission Veterans quarterback Landry Gilpin’s playmaking ability. The senior built his game on his elusiveness to extend plays or, sometimes, leave pass rushers in the dust. The San Antonio Wagner defense provided the stiffest challenge to Gilpin and the offensive line thanks to the quartet of senior linebackers Gregory Steptoe, Maximus Arellano, Michael Turbin along with junior cornerback DeMarcus Hendricks. Steptoe, Arellano, Turbin and Hendricks entered Saturday with 46 sacks between them. Each of those pass rushers got to Gilpin for five sacks Saturday, including Hendricks, who brought him down twice. Mission Veterans’ high-powered offense was thrown off its game and couldn’t match San Antonio Wagner’s running game score for score. The Thunderbirds knocked off the Patriots 54-21 in the Region IV-Class 5A Division I final Saturday at The Alamodome. San Antonio Wagner will advance to the Class 5A state semifinals for the first time in school history next week at NRG Stadium in Houston. 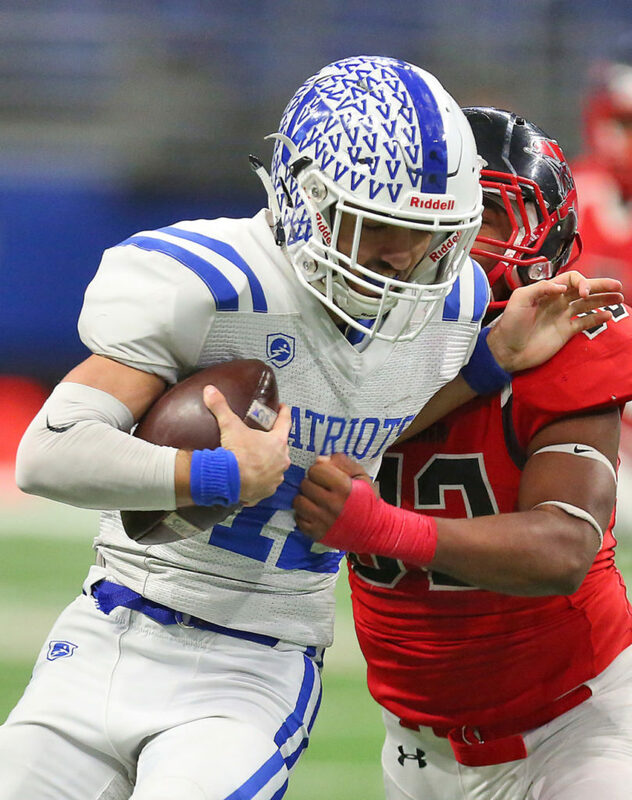 Mission Veterans quarterback Landry Gilpin (12) fights off San Antonio Wagner linebacker Michael Turbin (33) as he carries the ball during a Class 5A Division I regional final at the Alamodome on Saturday, Dec. 8, 2018, in San Antonio. The task for the Patriots defense was to stop gifted runners like Wagner sophomore L.J. Butler, senior Karlton Black and senior quarterback Tobias Weaver as a part of a Thunderbirds’ offense that rarely turned the ball over. While Butler, Black and Weaver each scored a touchdown in the first half, Mission Veterans forced three turnovers, including Weaver’s first two interceptions of the season. Weaver entered the regional final game with 20 passing touchdowns on the year. 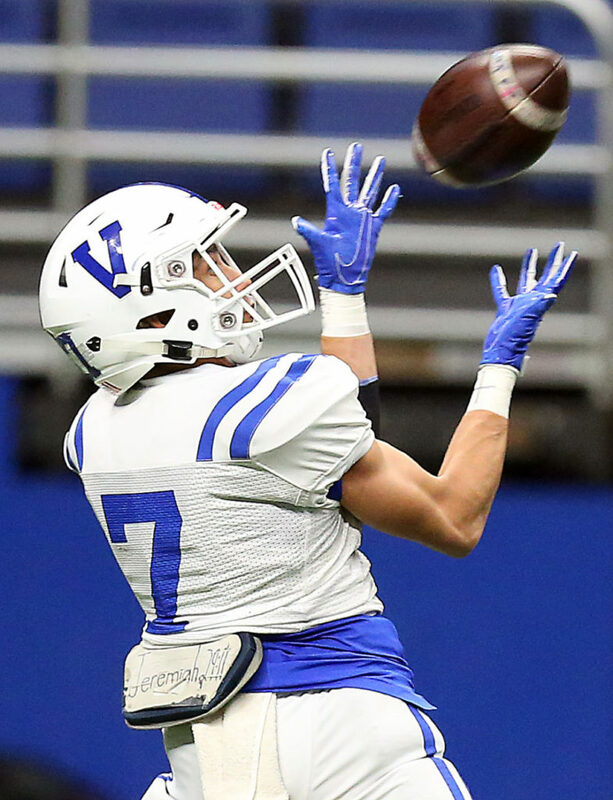 Mission Veterans wide receiver Mikey Garcia (7) reaches for a pass during a Class 5A Division I regional final against San Antonio Wagner at the Alamodome on Saturday, Dec. 8, 2018, in San Antonio. Landry Gilpin and the Mission Veterans (12-2) offense had some bright moments. Junior wideout Mikey Garcia caught two of Gilpin’s three touchdowns passes in the third quarter. Garcia finished with four receptions for 116 yards. The Patriots were down 21-7 at halftime, but they couldn’t get any closer in the second half. The Thunderbirds responded to Garcia’s touchdowns with scoring drives of their own. San Antonio Wagner (13-1) led by 21 heading into the fourth quarter. Mission Veterans wide receiver A.J. Gonzaque got the Patriot scoring started when he hauled in a two-yard touchdown pass in the second quarter to make it 14-7 Wagner. Gonzaque, who was out his entire freshman year with a torn ACL, completed his first postseason on the playing field for Mission Veterans. When the Patriots take the field again in 2019, they will be without key members from the 2018 squad, the first-ever Mission Veterans football team to break into the regional final round. The defense will miss stable pieces like Delgado and Gus Garza in the secondary as well as Joey Garcia and Jazz Vallejo at linebacker and Juan Ibarra on the defensive line. The biggest subtraction will be quarterback Landry Gilpin, the son of coach David Gilpin, who ended his career Saturday. Landry Gilpin turned in another 300-yard passing game (312), a 50-touchdown season through the air and the distinction as one of the greatest quarterbacks to ever put on a high school uniform in the Rio Grande Valley. Mission Veterans’ Joe Mendoza reacts after their defeat against San Antonio Wagner in Class 5A Division I regional final at the Alamodome on Saturday, Dec. 8, 2018, in San Antonio. 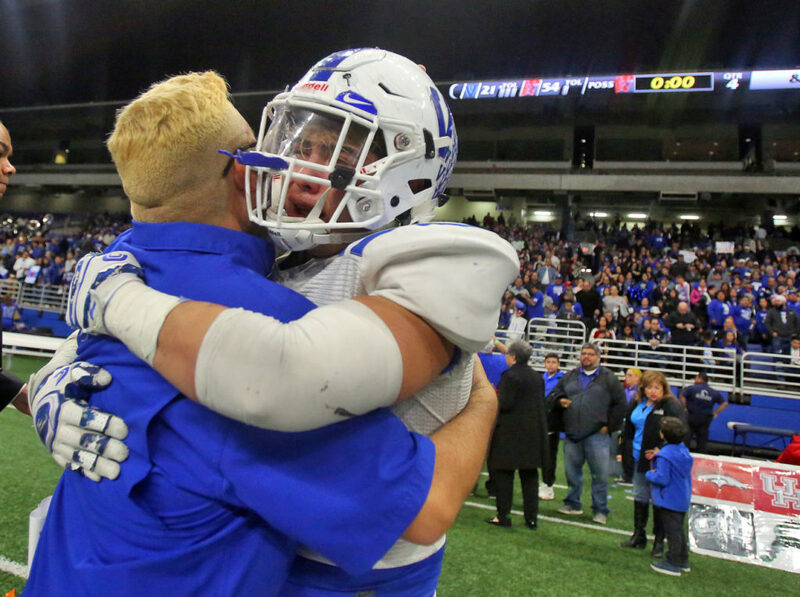 Mission Veterans and Valley football fans alike filled the Patriots’ side of The Alamodome, despite a 10 a.m. Saturday kickoff.